Dansc: There was some discussion about lowering the captain bar for this game, but I don't think a conclusion was ever reached. So how about it? As of now, we have one 4d, one 1d, two 2k (both in the same team) and the rest are 5k or weaker. How about dropping the captain bar to 2k and asking either fractic or tapir to join the white team? :) If we have just one captain per team, it can get quite slow at certain points. If we get more dan level players to join later on, we can of course pull the captain bar back up. gaius: I just joined the white team (as a soldier for now). I'm Dutch 1k and I hope to be 1 dan in the near future - if there is demand for a second captain I could volunteer. FireclawDrake: I think now would be a good time to decide if we are moving the Captain bar down to 2k or not, as IanDavis, Black's only current active captain said he cannot make moves for a while. Black also has Bass. It looks like moving it to 1k would add one more captain for each team beyond that. thanatos13: good news, jvloenen just joined black and I believe he is rather active. That's good. Fwiffo: White has been sitting for a bit and Herman seems to be the only * captain right now. Moving the bar to 1k would add a couple more which may be prudent. unkx80: I've joined the White team and made a move. Given the result of the poll below, I'll assume that it's okay to read the other team's discussions. However, for this game, I intend to let Herman drive the game, so I may choose to move only when no White captain makes a move for a few days. Dansc: I agree. How about a vote? Please mark your vote with a +. Keep the captain bar at 1d. Lower the captain bar to 1k. ++? Lower the captain bar to 2k. Hmmm, how do you know if someone's active or not ? unkx80: You guys should also agree on whether a honour system is in place. In the first game, some players followed the honour system while others were constantly looking into the opponents' pages. Fwiffo: I think an honor system should be in place, otherwise, why even bother having separate pages for discussion of moves? At the very least, there should be a single, consistent standard. tapir: That is fine with me, but it should just be clear beforehand. As I wasn't aware of my dishonourable behaviour being such dishonourable at all during the last game. I can easily change the team (if this is honourable :) but there are more players around my and fractics strength at SL anyway. Antone: I guess it's fine for me either way but since it's supposed to be a teaching game, full disclosure seems more efficent. JoazBanbeck I second what Antone said. unkx80: I am not playing for the moment. If I am, I am fine either way, but I would prefer not to have the honour system. schroeder: the votes suggest that suggestions should be public, right? are we supposed to give suggestions to the captain on this page, then? Fwiffo: It looks like the votes are going that way, but the pages should probably stay separate for organization purposes; they get cluttered fast as it is. thanatos13: is it okay to pick another or to cancel your own pick then pick another? I don't like my decision anymore. Dansc: I'd prefer making a second suggestion to removing any existing ones. Fwiffo: According to the rules, you can only make one suggestion per move. But if you take back the original suggestion and put up a new one, I don't see the harm. Chew: As a silly thought, it might be amusing to keep (either on the game page or the page for each color, a 'score' for each soldier on the teams. It would be interesting to track how many 'chosen' moves each player suggested. Might be too much work, though. Obviously, I like numbers. Dansc: Personally, I'd hate to make this a competition between soldiers as to who picks the best moves (or, at least, the ones that the captains choose). It's supposed to be a fun teaching game, after all. JoazBanbeck: Yeah, I agree, let's not encourage people to bring their egos into it. The first step to learning is admitting that one is ignorant. JoazBanbeck: The other objection is that it causes a divergence between what is good for the player and what is good for the team. If we are all trying to be right, then we will often tend to cluster around the 'right' move. But the best thing for the team is that the captain has the greatest range of reasonable moves. Fwiffo: Shouldn't be hard to keep a tally, and I don't see the harm. It would be easy enough to keep something like Fwiffo: ... at the bottom of the team page. A little bit of competition encourages people to look for the strongest moves, not just the most clever ones. thanatos13: however, it wouldn't be a good game anymore because there's no versatility, and the soldiers would all pick the blandest moves. FireclawDrake: I am slightly concerned about the manner in which the moves are placed on the main page. 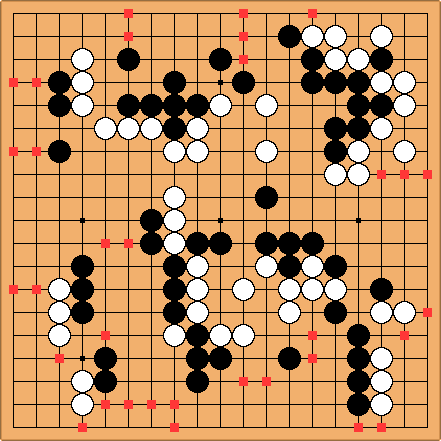 It's a little counter-intuitive, as I noticed when trying to read through the WuRenGo1 game, the diagrams have the newest set of 10 at the top, but the oldest move at the top, beside the diagram. It seems a little.. strange to read it this way and I suggest that we reverse this, so that new moves are inserted at the top of every time. FireclawDrake: I am currently making an SGF file that will have everything pertaining to the game, every diagram presented for both teams along with all the commentary for each. I was just wondering how many people would be interested in this, because if it's more than a few, I can keep it up-to-date with each recent move. I find these types of files much easier to read than the wiki format we have here. It just flows easier. Anyway, please comment. schroeder: I would like it very much! Following the game on the wiki is not easy, because you have to scroll to follow the commentary on the board... So the commented sgf would be really useful: Thanks! Joaz Banbeck: I like it. Antone? : I am updating my own local SGF version, but yours sounds much better, maybe we can join efforts ? Ted O'Mari: Is it posted someplace? Maximum: 3 days unless someone is sick etc. unkx80: I shall take note of this timing request. Dansc: It's nice to have the game rolling on at a good pace again, but enough is enough! Even if the first move suggested is the one the captain wants to play, I think he should wait a bit for more suggestions to let the soldiers interact too (unless there is a blatantly obvious only move). In a teaching game like this, thinking of a move to play is more important than the game itself. JoazBanbeck: I agree with this. I'd like to amend my suggestion about the minimum time. In addition to minimum time, it should be minimum number of suggestions. That is, I propose that the captain should not move unless there are at least 3? suggestions from soldiers. Dansc As a side-note, I've found this game type to be extremely educational. There have been a couple of times when all the moves I would like to play have already been suggested, but I still want to make a suggestion myself, so I have to look around for new moves I hadn't thought of before. Once or twice these moves have even actually been chosen by the captains. Really gets you thinking outside the box. unkx80: Like Herman, I also try to wait until 4-5 suggestions appear. My last move ( ) was an exception because I don't forsee what other suggestions the White soldiers could make, but I did waited for almost a day. If I am the captain currently driving the game, I also feel that: (a) If there are already 7-8 suggestions in only a couple of hours, then I shouldn't wait much further and make a move. (b) I usually prefer not to wait beyond two days to make a move because by then I would have moved on to other things. Bass: I would like one move to take under 12 hours, preferably about 6 hours or so. This way there will be more playing and less not-playing, which seems like a good idea. I do not mind waiting for the third or fourth suggestion, though I do not see the learning merits of this approach: thinking about alternatives is no less possible after the actual move, and if a captain has his mind set on the first suggestion, there is really no difference in whether the stone is on the board or not, save the soldier's motivation factor. With quicker play there are more situations to consider more often, which seems to offset this downside quite thoroughly. JoazBanbeck This is true only if you presume that it is not possible for one of us soldiers to think of a better move that you had not thought of already. In limited tactical situations in which you can read all of the branches, it may be true. But there can be situations in which a soldier may see something that you haven't. Also, as Herman says, remember timezones. Herman: The main purpose of this format is that players can think about the situation untainted by the prior explanations of stronger players, and can suggest moves and get comments on them from that perspective. Thinking about a situation after a move has been made and explained is not the same, and you're no longer getting comments on your move either. I think the most recent move ( ) is a prime example. 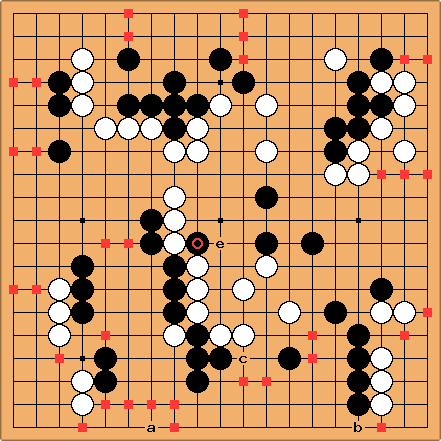 It was played only 10 hours after the last white move, which occurred around midnight European time. This means that many European players may not have had a chance at all to see the position yet. Furthermore, the move was chosen after only three suggestions, with neither tenuki nor the best local move (IMO) suggested yet. I think this is simply too fast. kanzenryu While we have a bit of a pause I'd love to see what people think in terms of estimating the score at the moment (after move 87). As a DDK I'm very weak at counting (actually I've never managed to count out a position, I just get lost when I try and give up). I've made a feeble effort, but I'd love to see what a strong player thinks. This is a very rough estimate, and doesn't count whatever points might occur on the left or right sides, reductions along the bottom, or attacks on the center or upper right stones. But roughly I think white needs to make up about 30 points somewhere. So should W resign? Not yet. Black still has a few weak groups and holes, enough that I think white has at least a chance of picking up that 30 points. But we're certainly behind. Tapir: I don't agree. Just look at a and b, you count 6 points too much for black at a, 2 points too much at b, again at least 2 points at c. You don't count points at all for white in the center. Even the secured ones. And you calculated all black stones to be alive (even !) and not even allowing for some white profit while black has to connect to make life (and a single stone not to be answered in favor of connection or similar can easily amount to 15 and more points now, look at the top and the right side). It doesn't feel like white is behind to me. I actually prefer White, Black has some way to go to safe all his stones, I am not seeing this yet (the black top is practically dead if they don't concede at least the corner to white). emeraldemon: Someone went above and re-edited my estimate, adding moves that hadn't been played yet and points to the estimates (so they didn't add correctly anymore). I've tried to leave the above estimate as it was, but for fun, I'll put an update, now that we've played 15 more moves. The main difference here is that white picked up big points in the upper right corner. For what it's worth, I'm intentionally not trying to add penalties for weak groups or gains for attacking chances, only to get an idea of what territory is relatively solid for both players. On the left side especially, there are big points that could go either way, but I'm not going to guess who will get it. I'm just leaving it uncounted. In the same way, white picked up 9 points in the corner over this past sequence, but I feel justified in not counting those points as territory in my previous estimate. Black could well have blocked that cut, preventing us from getting any points in the corner. White would gain a big attacking chance on the black group then, but how do you put points on something like that? tapir: the obvious difference in estimates may result from where not to count (left center, right edge, smaller black top. getting the very big double sente on the first line along the lower left edge is assumed here - however it is whites turn and i am looking forward that we are using our sente well. Very close, but Black center looks smaller than 6 points now, Black left edge will hardly get the 5 points counted. 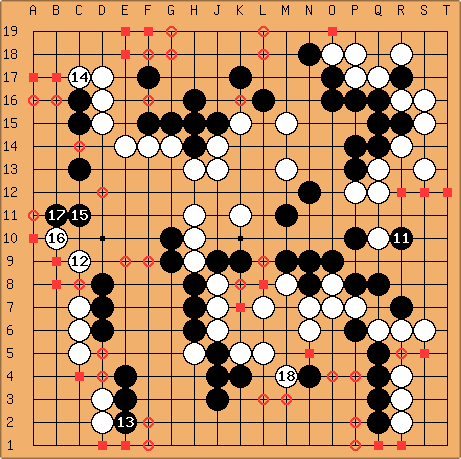 White probably keeps sente on the right, play the remaining sente and than the biggest reverse sente and will lead with more than the value of that reverse sente.